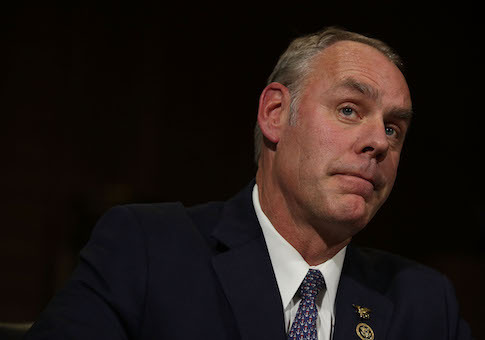 Secretary of the Interior Ryan Zinke said about 30 percent of his department is not loyal to him and the man who appointed him, President Donald Trump. Speaking to the National Petroleum Council, Zinke prioritized deregulation but said the administration’s efforts are meeting resistance from within the department, the AP reports. He used the metaphor of the Interior Department as a pirate crew divided about what to do when it captures a ship. "I got 30 percent of the crew that’s not loyal to the flag," Zinke said. He explained that he knew the department of 70,000 was not loyal to the Trump administration when he assumed the job in March. He said Interior was like pirates seizing "a prized ship at sea and only the captain and the first mate row over" to take control of it. He stressed the message that the department needs a culture change to become more business-friendly overall. "There’s too many ways in the present process for someone who doesn’t want to get [a regulatory action] done to put it a holding pattern," Zinke said. He has found the bureaucracy adept at maintaining the status quo, which is why he’s pursuing a "major reorganization" to shift the agency’s decision-making out of Washington. He even wants to move the Bureau of Reclamation and Bureau of Land Management out west. "Push your generals where the fight is," Zinke said. He has not announced which western states to which he would like to move those bureaus. He has high hopes for the restructuring that is in store for the future of the Interior Department. "It’s going to be huge," he said. "I really can’t change the culture without changing the structure." He has also focused a lot of his efforts on streamlining the permit process for work that includes logging and energy development. This is a key priority for Trump. "The president wants it yesterday," Zinke said, referring to permits. "We have to do it by the law." He also said the Endangered Species Act needed to have an "off-ramp" for species no longer endangered, in order that bureaucrats would stop abusing the law. In August, Zinke announced he would not be eliminating monuments that take up large tracts of land, soothing the fears of some environmental groups. However, some critics have argued that he is not sufficiently committed to opening up lands to energy development. This entry was posted in Politics and tagged Department of the Interior, Energy, Trump Administration. Bookmark the permalink.